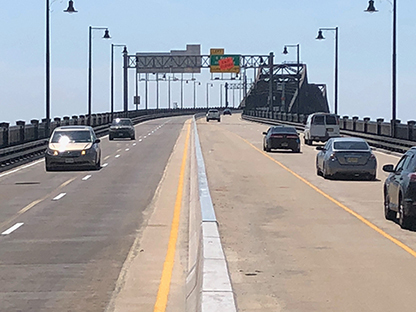 Pulaski Skyway northbound lanes reopened, restoring two-way traffic on the Skyway. The traffic pattern on the Skyway will change near the Tonnele exit, as shown in this video. Vehicles heading to Tonnele Circle, Route 1&9 North and the Lincoln Tunnel must stay to the right to exit. Motorists heading to Route 139 and the Holland Tunnel must use the left lane. In addition, the Newark, Kearny, and Broadway ramps will remain closed for rehabilitation in future contracts. With the reopening of the northbound lanes on the Skyway, Route 139 lower level will resume the variable lane configuration Mondays through Fridays (except Holidays) with two lanes inbound (eastbound) and one lane outbound (westbound) in the morning and two lanes outbound (westbound) and one lane inbound (eastbound) in the afternoon and evening. Sunday afternoons and evenings also will have two inbound lanes going towards the Tunnel, with one lane outbound.